Facebook was on its way to overtaking Orkut to become the most popular social networking site in India. 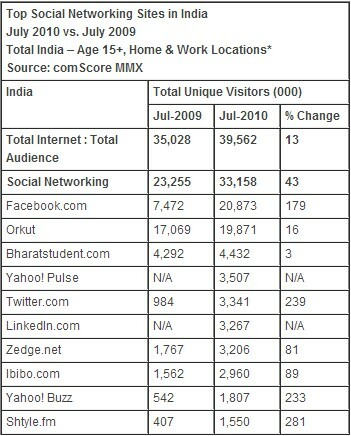 Recent research from comScore has revealed that Facebook managed to bump Orkut off the top spot in July 2010. According to comScore statistics, Facebook had 20.9 million unique users in India in July 2010, compared to 7.47 million in July 2009, while Orkut had 19.9 million users in July 2010 and 17.7 million users in July 2009. While both networks have shown growth in the last year, Facebook’s 179% growth far outstrips Orkut’s 16% growth rate. No single factor is likely to be responsible for this change in the market preference. According to Asheesh Raina of Gartner, factors such as Facebook’s intuitive user interface and the availability of various games on Facebook could have effected the change. It is also possible that the international popularity of Facebook could have had a snowball effect. Raina also believes that Orkut will continue to remain popular among older users, while Facebook may be more popular with youngsters. The data was collected from users who connect from their homes or offices, but not from cybercafés or mobile phones, as the use of mobile phones for social networking is still not very popular in India. Orkut had to face some resistance in India, and was even taken to court a while ago due to content that was considered offensive to local politicians. Facebook also had to block some pages that the Indian government felt might be perceived as inappropriate by Muslims. Google won’t be too happy with this news as it marks yet another failure to succeed in the social networking market. Facebook, on the other hand, has opened an office in India, as the country now represent the 7th largest market in the world with regards to the use of the social networks and is also among the fastest growing markets.